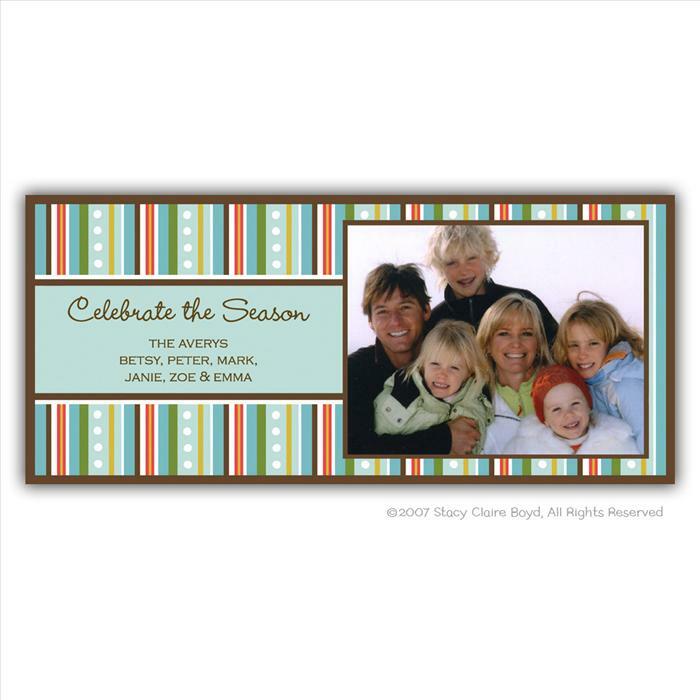 Description: Keep your family and friends All Wrapped Up with this "Imagitation" photo card. This unique design features stripes in varying widths of green, shades of blue with white dots, yellow, orange, white and trimmed in brown. An "Imagitation" is an image from a personal photo that is incorporated onto the card during the printing process. Card measures 4.75" x 9" and can only be horizontal. Price includes up to 8 lines of text (extra lines are $5.00) E-mail your picture and message. You will see a proof before printing. Matching return address sticky or printed return address is available. Printed return address: 25 for $47, 50 for $55, 75 for $66, 100 for $78, additional 25's for $18 each.